For Regency Product Price Lists, click here to go to our Price Lists page. The Wingrove 6 model comes with each panel the same size so the single door and two opening windows can be positioned anywhere.This model above is in Deal cladding with leaded glazing option and a standard roof. The Wingrove 86 has two double sections front and back, all the other sections are interchangeable allowing the windows to be placed to suit yourself.This model is in Cedar cladding with the Georgian glazing option and additional red roofing felt. The Wingrove 8 has all eight panels the same size allowing the double doors and four window sections to be placed anywhere to achieve the apperance you require.The model shown is in Deal cladding with the deeper Georgian windows and fully-glazed doors, which is available on all size models. The ultimate chalet combining style with strength. The Regent will enhance any garden or poolside. This building lends itself to be an office, games room, fitness studio, or merely a room to take tea on a hot summer’s afternoon. Complete with half-glazed double doors, opening windows throughout, window boxes to each window and red roofing felt, as standard. The Regent pictured above is depicted in Deal cladding with Georgian glazing. 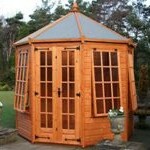 However, both Cedar or Deluxe cladding and a choice of leaded glazing are also available. We cannot stress enough the importance of importance of putting your garden building onto a solid level foundation. Get it right and your building will fit together perfectly and last for years. Get it wrong and you could have problems with assembly, the shed will not last nearly as long and the doors may not close properly. The size of your building is approximate and does not allow for roof overhangs. When deciding where to site your building you must allow sufficient room for the roof and allow access for assembling, maintenance and retreating of the building. The minimum space required is usually 300mm (1ft) all the way around the building although 500mm is preferable. Your base does not have to be larger than the building. If using bearers or sleepers they must run the opposite way to the joists on the building floor. Direction of floor joists will vary depending on the size and model of the building. If using slabs the whole area should be paved in order to support the floor. A slab in each corner is not adequate. Whatever base you use it is imperative that it is firm, flat and level otherwise your building will not fit together properly and will not last as long. So please do spend time on the base. If you need to check the length, direction or quantity of bearers you need, exact floor measurements or further advice of please do not hesitate to contact us during office hours. 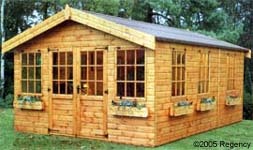 We do offer a base laying service for smaller sheds up to 8 x 6.